I'm delighted to announce a terrific event this fall at Emory Law School for all of you who teach or are interested in international humanitarian law. 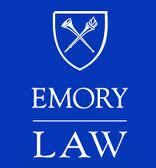 On November 2-3, 2012, the International Humanitarian Law Clinic at Emory University School of Law and the International Committee of the Red Cross will convene the next Teaching International Humanitarian Law Workshop in Atlanta, Georgia. The Workshop is targeted at law professors in the United States and Canada who are interested in: teaching a course in IHL (otherwise known as the Law of Armed Conflict) for the first time; integrating IHL modules into their current courses; and/or rethinking their current teaching of this important subject. ► Identifying strategies for developing curricula, responding to current events, and gaining support from school administrations for the teaching of IHL. The Workshop provides an opportunity for law faculty to think creatively about their teaching of IHL and to network with others to support and expand their teaching of these topics. The cost of the two-day seminar is $250 per person and includes breakfast and lunch for both days, dinner Friday night, as well as all materials. Information about the Workshop and registration is available here, or contact me, Laurie Blank, Director, International Humanitarian Law Clinic, at lblank@emory.edu.